Use our API to get your iOS apps automatically compiled and sent to iTunes. Eliminate the hassle by having your iOS apps automatically submitted to iTunes right from your Siberian. No need to get a Mac to compile your iOS apps! From your backoffice, you just have to click on the button “Generate and Publish” to get your app sent to our build server which will compile it and send it to the iTunes account of your choice. During the process all the certificates are created automatically for you. Especially the .pem certificate, for the iOS push notifications, is created and sent directly to your backoffice. This service does not support Two-Factor Authentication. You will find how to use the iOS Auto-publish service if your Apple account is protected by Two-Factor Authentication in the documentation here. Unfortunately you can’t use the iOS Auto-publish if you have an Apple account that is “Individual”. What if I stop my Auto-publish license? You will be able to build your iOS apps until the end of your subscription and then you won’t be charged anymore. If I stop my Auto-publish license does it have an impact to published apps? Not at all. The “Auto-publish” license is about submitting apps only, it is only about submitting your apps automatically or not. Will I still be able to publish manually by myself? Yes sure. You are free to use the “Auto-publish” system or to publish yourself. 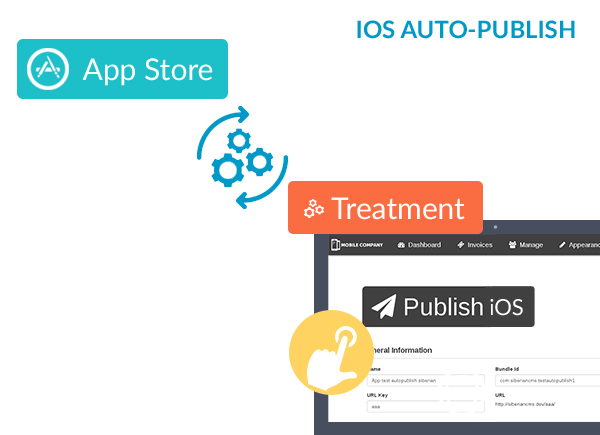 What do I need to get my apps automatically submitted through the Auto-publish system? You need obviously an Apple Developer account and to buy a license, enter the license key in your backoffice and click on the button! What is the process exactly once I have my license? 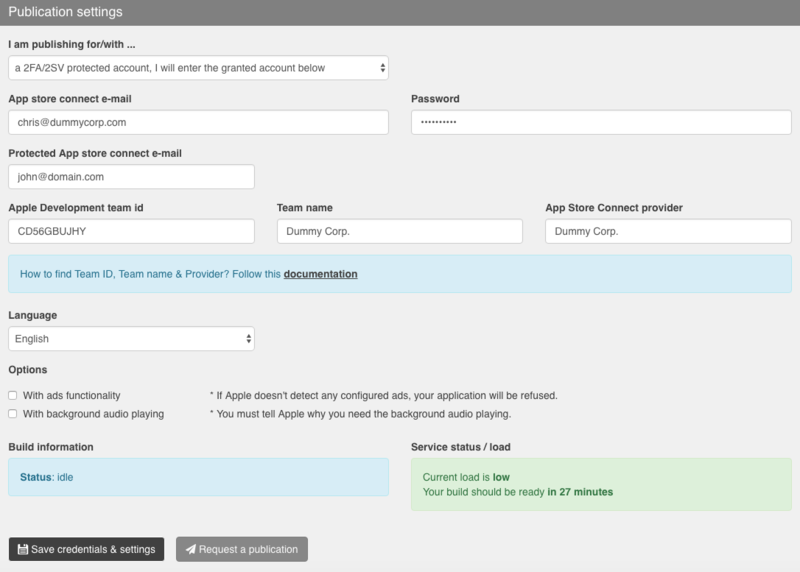 From your backoffice, enter your iTunes Connect credentials and click on the button “Generate and Publish” once your app is ready to be submitted. Your app enters the queue and is going to be compiled and sent by our build servers. Once sent to iTunes you are warned by email and in your backoffice that your app has been submitted. You just have to complete your app page on iTunes Connect with your screenshots and description and click on “Submit for review”. No specific requirement, it works for apps on Ionic design only.